The Democratic presidential candidates faced off on Wall Street, health care, and other domestic and foreign policy issues for their fourth debate in Charleston, South Carolina on January 17, 2016. The debate was hosted by NBC News and moderated by Lester Holt and Andrea Mitchell. HOLT: We'll begin with 45 second opening statements from each candidate, starting with Secretary Clinton. CLINTON: Well, good evening. And I want to thank the Congressional Black Caucus Institute and the people of Charleston for hosting us here on the eve of Martin Luther King Day tomorrow. You know, I remember well when my youth minister took me to hear Dr. King. I was a teenager. And his moral clarity, the message that he conveyed that evening really stayed with me and helped to set me on a path to service. I also remember that he spent the last day of his life in Memphis, fighting for dignity and higher pay for working people. And that is our fight still. We have to get the economy working and incomes rising for everyone, including those who have been left out and left behind. We have to keep our communities and our country safe. We need a president who can do all aspects of the job. I understand that this is the hardest job in the world. I'm prepared and ready to take it on and I hope to earn your support to be the nominee of the Democratic Party and the next president of the United States. HOLT: Thank you. Senator Sanders, your opening statement, sir. SANDERS: Thank you. As we honor the extraordinary life of Dr. Martin Luther King Jr., it's important not only that we remember what he stood for, but that we pledge to continue his vision to transform our country. As we look out at our country today, what the American people understand is we have an economy that's rigged, that ordinary Americans are working longer hours for lower wages, 47 million people living in poverty, and almost all of the new income and wealth going to the top one percent. SANDERS: And then, to make a bad situation worse, we have a corrupt campaign finance system where millionaires and billionaires are spending extraordinary amounts of money to buy elections. This campaign is about a political revolution to not only elect the president, but to transform this country. And Governor O'Malley, your opening statement, sir. O'MALLEY: Thank you. My name is Martin O'Malley, I was born the year Dr. King delivered his "I Have A Dream" speech. And I want to thank the people of South Carolina, not only for hosting our debate here tonight, but also for what you taught all of us in the aftermath of the tragic shooting at Mother Emanuel Church. You taught us, in fact, in keeping with Dr. King's teaching, that love would have the final word when you took down the Confederate flag from your state house; let go of the past and move forward. Eight years ago, you brought forward a new leader in Barack Obama to save our country from the second Great Depression. And that's what he's done. Our country's doing better, we're creating jobs again. But in order to make good on the promise of equal opportunity and equal justice under the law, and we have urgent work to do, and the voices of anger and fear and division that we've heard coming off of the Republican presidential podiums are pretty loud. We need new leadership. We need to come together as a people and build on the good things that President Obama has done. That's why I'm running for president. I need your help, I ask for your vote, and I look forward to moving our country forward once again. HOLT: All right. And Governor, thank you. HOLT: All right, to our first question, now. The first question, I'll be addressing to all of the candidates. President Obama came to office determined to swing for the fences on health care reform. Voters want to know how you would define your presidency? How would you think big? So complete this sentence: in my first 100 days in office, my top three priorities will be -- fill in the blank. SANDERS: Well, that's what our campaign is about. It is thinking big. It is understanding that in the wealthiest country in the history of the world, we should have health care for every man, woman, and child as a right that we should raise the minimum wage to at least $15 an hour; that we have got to create millions of decent- paying jobs by rebuilding our crumbling infrastructure. So, what my first days are about is bringing America together, to end the decline of the middle class, to tell the wealthiest people in this country that yes, they are going to start paying their fair share of taxes, and that we are going to have a government that works for all of us, and not just big campaign contributors. HOLT: Secretary Clinton, same question, my first 100 days in office, my top three priorities will be. CLINTON: I would work quickly to present to the Congress my plans for creating more good jobs in manufacturing, infrastructure, clean and renewable energy, raising the minimum wage, and guaranteeing, finally, equal pay for women's work. I would also be presenting my plans to build on the Affordable Care Act and to improve it by decreasing the out-of-pocket costs by putting a cap on prescription drug costs; by looking for ways that we can put the prescription drug business and the health insurance company business on a more stable platform that doesn't take too much money out of the pockets of hard-working Americans. And third, I would be working, in every way that I knew, to bring our country together. We do have too much division, too much mean- spiritedness. There's a lot we have to do on immigration reform, on voting rights, on campaign finance reform, but we need to do it together. That's how we'll have the kind of country for the 21st century that we know will guarantee our children and grandchildren the kind of future they deserve. HOLT: Governor O'Malley, same question. O'MALLEY: Thank you. First of all, I would lay out an agenda to make wages go up again for all Americans, rather than down. Equal pay for equal work, making it easier rather than harder for people to join labor unions and bargain collectively for better wages; getting 11 million of our neighbors out of the underground shadow economy by passing comprehensive immigration reform, raising the minimum wage to $15 an hour, however we can, wherever we can. Secondly, I believe the greatest business opportunity to come to the United States of America in 100 years is climate change. And I put forward a plan to move us to a 100 percent clean electric energy grid by 2050 and create 5 million jobs along the way. O'MALLEY: Finally -- I'm sorry, that was second, Lester. O'MALLEY: And third and finally, we need a new agenda for America's cities. We have not had a new agenda for America's cities since Jimmy Carter. We need a new agenda for America cities that will invest in the talents and skills in our people, that will invest in CBVG transportation, infrastructure and transit options, and make our cities the leading edge in this move to a redesigned built clean green energy future that will employ our people. HOLT: All right governor thank you. We've all laid out large visions and we're going to cover a lot of the ground you talked about as we continue in the evening. The last couple of weeks of this campaign have featured some of the sharpest exchanges in the race. Let's start with one of them, the issue of guns. Senator Sanders, last week Secretary Clinton called you quote, "a pretty reliable vote for the gun lobby." Right before the debate you changed your position on immunity from lawsuits for gun manufacturers, can you tell us why? SANDERS: Well, I think Secretary Clinton knows that what she says is very disingenuous. I have a D-minus voting record from the NRA. I was in 1988, there were three candidates running for congress in the state of Vermont, I stood up to the gun lobby and came out and maintained the position that in this country we should not be selling military style assault weapons. SANDERS: What I have said, is that gun manufacturer's liability bill has some good provisions among other things, we've prohibited ammunition that would've killed cops who had protection on. We have child safety protection work on guns in that legislation. And what we also said, "is a small mom and pop gun shop who sells a gun legally to somebody should not be held liable if somebody does something terrible with that gun." HOLT: Secretary Clinton, would you like to respond to Senator Sanders. CLINTON: Yes look, I have made it clear based on Senator Sanders' own record that he has voted with the NRA, with the gun lobby numerous times.He voted against the Brady Bill five times. He voted for what we call, the Charleston Loophole. He voted for immunity from gunmakers and sellers which the NRA said, "was the most important piece of gun legislation in 20 years. " HOLT: All right, Governor O'Malley, you signed tough gun control measures as governor of Maryland and there are a lot Democrats in the audience here in South Carolina who own guns. This conversation might be worrying many of them. They may be hearing, "you want to take my guns. What would you say to them? O'MALLEY: This is what I would say Lester, look see, I've listened to Secretary Clinton and Senator Sanders go back and forth on which of them has the most inconsistent record on gun safety legislation and I would have to agree with both of them. They've both been inconsistent when it comes to this issue. ... we're able to actually do these things. HOLT: Alright, Governor, thank you. Secretary Clinton, this is a community that has suffered a lot of heartache in the last year. Of course, as you mentioned, the church shootings. We won't forget the video of Walter Scott being shot in the back while running from police. We understand that a jury will decide whether that police officer was justified, but it plays straight to the fears of many African American men that their lives are cheap. Is that perception, or in your view, is it reality? CLINTON: Well, sadly it's reality, and it has been heartbreaking, and incredibly outraging to see the constant stories of young men like Walter Scott, as you said, who have been killed by police officers. Their needs to be a concerted effort to address the systemic racism in our criminal justice system. ...for offensive that do not lead to the same results for white men. So, we have a very serious problem that we can no longer ignore. HOLT: You time is up. SANDERS: ... Let me respond to what the secretary said. We have a criminal justice system which is broken. Who in America is satisfied that we have more people in jail than any other country on Earth, including China?Disproportionately African American, and Latino. Who is satisfied that 51% of African American young people are either unemployed, or underemployed? Who is satisfied that millions of people have police records for possessing marijuana when the CEO's of Wall Street companies who destroyed our economy have no police records. HOLT: ... Just over a week ago the chairman of the Congressional Black Caucus endorsed Secretary Clinton, not you. He said that choosing her over you was not a hard decision. In fact, our polling shows she's beating you more than two to one among minority voters. How can you be the nominee if you don't have that support? SANDERS: Well, let me talk about polling. (LAUGHTER) SANDERS: As Secretary Clinton well knows, when this campaign began she was 50 points ahead of me. We were all of three percentage points. Guess what? In Iowa, New Hampshire, the race is very, very close. Maybe we're ahead New Hampshire. SANDERS: In terms of polling, guess what? We are running ahead of Secretary Clinton. In terms of taking on my taking on my good friend, Donald Trump, beating him by 19 points in New Hampshire, 13 points in the last national poll that we saw. To answer your question. When the African American community becomes familiar with my Congressional record and with our agenda, and with our views on the economy, and criminal justice -- just as the general population has become more supportive, so will the African American community, so will the Latino community. We have the momentum, we're on a path to a victory. HOLT: Governor, I'm going to come to you in a second. Google searches for the words, "Black Lives Matter" surpassed, "civil rights movement". And, here in South Carolina, "black lives matter" was the number one trending political issue. HOLT: Governor O'Malley, you've campaigned on your record as governor of Maryland, and before that, the mayor of Baltimore. Last year, of course, Baltimore was rocked by violent unrest in the wake of the death of Freddie Gray. And right from the start of your campaign, you've been dogged by those who blame your tough-on-crime, so-called zero tolerance policies as mayor for contributing to that unrest. What responsibility do you bear? O'MALLEY: Yes, let's talk about this. When I ran for mayor in 1999, Lester, it was not because our city was doing well. It was because we were burying over 300 young, poor black men every single year. And that's why I ran, because, yes, black lives matter. And we did a number of things. We weren't able to make our city immune from setbacks as the Freddie Gray unrest and tragic death showed. But we were able to save a lot of lives doing things that actually worked to improve police and community relations. The truth of the matter is, we created a civilian review board. And many of these things are in the new agenda for criminal justice reform that I've put forward. O'MALLEY: ... and to do more of them to reform our criminal justice system. HOLT: Let's talk more about policing and the criminal justice system. Senator Sanders, a few times tonight we're going to hear from some of the most prominent voices on YouTube, starting with Franchesca Ramsey, who tackles racial stereotypes through her videos. Let's watch. FRANCHESCA RAMSEY: Hey, I'm Franchesca Ramsey. I believe there's a huge conflict of interest when local prosecutors investigate cases of police violence within their own communities. For example, last month, the officers involved in the case of 12- year-old Tamir Rice weren't indicted. How would your presidency ensure that incidents of police violence are investigated and prosecuted fairly? SANDERS: I apologize for not hearing all of that question. HOLT: Would you like me to read it back to you? HOLT: Prosecutors -- "I believe there's a huge conflict of interest when local prosecutors investigate cases of police violence within their communities. Most recently, we saw this with a non- indictment of the officers involved in the case of 12-year-old Tamir Rice. How would you presidency ensure incidents of police violence are investigated and prosecuted fairly?" SANDERS: Absolutely. This is a responsibility for the U.S. Justice Department to get involved. Whenever anybody in this country is killed while in police custody, it should automatically trigger a U.S. attorney general's investigation. And thirdly, we have got to de-militarize our police departments so they don't look like occupying armies. We've got to move toward community policing. HOLT: Secretary Clinton, this question is for you. Tonight parts of America are in the grip of a deadly heroin epidemic, spanning race and class, hitting small towns and cities alike. It has become a major issue in this race. CLINTON: Well, Lester, you're right. Everywhere I go to campaign, I'm meeting families who are affected by the drug problem that mostly is opioids and heroin now, and lives are being lost and children are being orphaned.And I've met a lot of grandparents who are now taking care of grandchildren. CLINTON: ... a growing epidemic. HOLT: Senator Sanders, would you like to respond? I agree with everything the Secretary said, but let me just add this, there is a responsibility on the part of the pharmaceutical industry and the drug companies who are producing all of these drugs and not looking at the consequence of it. SANDERS: ... a part of that. HOLT: We're going to get into all that coming up. O'MALLEY (? ): Lester, just ten seconds. HOLT: ... and when we come back, the anger brewing in America. HOLT: Welcome back to Charleston. Let's turn to another area where there has been fierce disagreement -- that would be health care. Senator Sanders and Secretary Clinton, you both mentioned it in your 100-day priorities. Let's turn to my colleague, Andrea Mitchell now to lead that questioning. Secretary Clinton, Senator Sanders favors what he calls "Medicare for all." Now, you said that what he is proposing would tear up Obamacare and replace it. CLINTON: Well, Andrea, I am absolutely committed to universal health care.I have worked on this for a long time, people may remember that I took on the health insurance industry back in the '90s, and I didn't quit until we got the children's health insurance program that ensures eight million kids. SANDERS: Secretary -- Secretary Clinton didn't answer your question. Because what her campaign was saying -- Bernie Sanders, who has fought for universal health care for my entire life, he wants to end Medicare, end Medicaid, end the children's health insurance program. That is nonsense. CLINTON: You know, I have to say I'm not sure whether we're talking about the plan you just introduced tonight, or we're talking about the plan you introduced nine times in the Congress. But the fact is, we have the Affordable Care Act. That is one of the greatest accomplishments of President Obama, of the Democratic Party, and of our country. And we have already seen 19 million Americans get insurance. We have seen the end of pre-existing conditions keeping people from getting insurance. CLINTON: Now, there are things we can do to improve it, but to tear it up and start over again, pushing our country back into that kind of a contentious debate, I think is the wrong direction. SANDERS: It is -- it is absolutely inaccurate. O'MALLEY: I have to talk about something that's actually working in our state. SANDERS: No one is tearing this up, we're going to go forward. But with the secretary neglected to mention, not just the 29 million still have no health insurance, that even more are underinsured with huge copayments and deductibles. Tell me why we are spending almost three times more than the British, who guarantee health care to all of their people? Fifty percent more than the French, more than the Canadians. The vision from FDR and Harry Truman was health care for all people as a right in a cost-effective way. O'MALLEY: Andrea -- Andrea -- Andrea. O'MALLEY: Instead of -- Andrea, I think, instead of attacking one another on health care, we should be talking about the things that are actually working. In our state, we have moved to an all-payer system. With the Affordable Care Act, we now have moved all of our acute care hospitals, that driver of cost at the center, away from fee-for- service. CLINTON: And that's exactly what we are able to do based on the foundation of the Affordable Care Act -- what Governor O'Malley just said is one of the models that we will be looking at to make sure we do get costs down, we do limit a lot of the unnecessary costs that we still have in the system. MITCHELL: .. and tonight you've released a very detailed plan, just two... SANDERS: Not all that detailed. MITCHELL: ... well, two hours before the debate, you did. ... here is what the real point is, in terms of all of the issues you've raised -- the good questions you've raised. You know what it all comes down to? Do you know why we can't do what every other country -- major country on Earth is doing? It's because we have a campaign finance system that is corrupt, we have super PACs, we have the pharmaceutical industry pouring hundreds of millions of dollars into campaign contributions and lobbying, and the private insurance companies as well. ... many, many millions of dollars attacking me, and probably will so again, because of what I believe we can do building on the Affordable Care Act, I think it's important to point out that there are a lot of reasons we have the health care system we have today. HOLT: And that's time (ph). We're gonna take a turn now. Secretary Clinton, in his final State of the Union address, President Obama said his biggest regret was his inability to bring the country together. If President Obama couldn't do it, how will you? CLINTON: Well, I think it's an important point the president made in his State of the Union. And here's what I would say. I will go anywhere, to meet with anyone, at any time to find common ground. CLINTON: So I know it's hard, but I also know you've got to work at it every single day. I look out here, I see a lot of my friends from the Congress. And I know that they work at it every single day. Because maybe you can't only find a little sliver of common ground to cooperate with somebody from the other party, but who knows. If you're successful there, maybe you can build even more. That's what I would do. HOLT: That's time. Senator Sanders, response. SANDERS: A couple of years ago, when we understood that veterans were not getting the quality care they needed in the timely manner, I worked with folks like John McCain and others to pass the most comprehensive veteran's health care legislation in modern history. SANDERS: The real issue is that in area after area, raising the minimum wage to $15 bucks an hour. The American people want it. Rebuilding our crumbling infrastructure, creating 13 million jobs, the American people want it. The pay equity for women, the American people want it. Demanding that the wealthy start paying their fair share of taxes. The American people want it. SANDERS: Did I say that? HOLT: How will you win a general election labeling yourself a democratic socialist? SANDERS: Because of what I believe in what I was just saying. The Democratic party needs major reform. To those of you in South Carolina, you know what, in Mississippi, we need a 50-state strategy so that people in South Carolina and Mississippi can get the resources that they need. O'MALLEY: Yes, but senator you never came to campaign for Vincent Sheheen when he was running for governor. In fact, neither of you came to campaign for Vincent Sheheen when he was running for governor. HOLT: We can talk all we want about wanting to build a stronger Democratic party, but Lester, the question you answered, it's no laughing matter. The most recurring question I get when I stand on the chair all across Iowa and talk with my neighbors is, how are you going to heal the divisions and the wounds in our country? This is the biggest challenge we face as a people. All my life, I brought people together over deep divides and very old wounds, and that's what we need now in a new leader. We cannot keep talking past each other, declaring all Republicans are our enemies or the war is all about being against millionaires or billionaires, or it's all against American Muslims, all against immigrants. Look, as Frederick Douglas said, we are one, our cause is one, and we must help each other if we are going to succeed. HOLT: And that is right. SANDERS: And I respectfully disagree. HOLT: Secretary Clinton, our next question is for you. Here's another quantitative problem. SANDERS: And I respectfully disagree with my friend over here. And that is, you are right. All of us have denounced Trump's attempts to divide this country: the anti-Latino rhetoric, the racist rhetoric, he anti-Muslim rhetoric. HOLT: And we're going to get into that coming up. But Secretary Clinton, here's a question from YouTube. It's from a young video blogger who has over 5 million subscribers. He has a question about the importance of younger voters. FRANTA: Hi, I'm Connor Franta, I'm 23 and my audience is around the same age. Getting my generation to vote should be a priority for any presidential candidate. Now I know Senator Sanders is pretty popular among my peers, but what I want to know is, how are all of you planning on engaging us further in this election? CLINTON: Well thanks for the question and congratulations on five million viewers on YouTube, that's quite an accomplishment. Look, this election is mostly about the future and therefore it is of greatest urgency for young people. CLINTON: That turning over our White House to the Republicans would be bad for everybody especially young people. HOLT: A quick follow up -- a thirty second follow up. Why is Senator Sanders beating you to 2 to 1 among younger votes? CLINTON: Look, I have the greatest respect for Senator Sanders and for his supports and I'm going to keep working as hard as I can to reach as many people of all ages about what I will do, what the experience and the ideas that I have that I will bring to the White House and I hope to have their support when I'm the Democratic nominee. HOLT: We're going to take a break. When we come back; big banks, big business and big differences among the three candidates on the American Economy. We'll be right back. HOLT: Welcome back from Charleston. Let's turn now to the economy. Senator Sanders, you released a tough new ad last week in which without mentioning Secretary Clinton by name, you talk about two Democratic visions for regulating Wall Street. "One says it's OK to take millions from big banks and tell them what to do. My plan, break up the big banks, close the tax loopholes and make them pay their fair share." What do you see as the difference between what you would do about the banks and what Secretary Clinton would do? HOLT: Secretary Clinton, help the voter understand the daylight between the two of you here. CLINTON: Well, there's no daylight on the basic premise that there should be no bank too big to fail and no individual too powerful to jail. We agree on that. But where we disagree is the comments that Senator Sanders has made that don't just affect me, I can take that, but he's criticized President Obama for taking donations from Wall Street, and President Obama has led our country out of the great recession. The Dodd-Frank bill and then to sign it was one of the most important regulatory schemes we've had since the 1930s. So I'm going to defend Dodd- Frank and I'm going to defend President Obama for taking on Wall Street, taking on the financial industry and getting results. HOLT: Senator Sanders, your response. SANDERS: Set the record right. In 2006 when I ran for the Senate, Senator Barack Obama was kind enough to campaign for me, 2008, I did my best to see that he was elected and in 2012, I worked as hard as I could to see that he was reelected. He and I are friends. We've worked together on many issues. We have some differences of opinion. CLINTON: Your profusion of comments about your feelings towards President Obama are a little strange given what you said about him in 2011. But look, I have a plan that most commentators have said is tougher, more effective, and more comprehensive. O'MALLEY: Yes, thank you. Yes, Lester, what Secretary Clinton just said is actually not true. What -- I have put forward a plan that would actually put cops back on the beat of Wall Street. I have put forward a plan that was heralded as very comprehensive and realistic. In prior debates I've heard you even bring up -- I mean, now you bring up President Obama here in South Carolina in defense of the fact of your cozy relationship with Wall Street. In an earlier debate, I heard you bring up even the 9/11 victims to defend it.The truth of the matter is, Secretary Clinton, you do not go as far as reining in Wall Street as I would. HOLT: Secretary Clinton, 30-second response. O'MALLEY: And we have never used it. CLINTON: ... with his regulators to make those decisions. SANDERS: Let me give you an example of how corrupt -- how corrupt this system is. Goldman Sachs recently fined $5 billion. Goldman Sachs has given this country two secretaries of treasury, one on the Republicans, one under Democrats. SANDERS: The leader of Goldman Sachs is a billionaire who comes to Congress and tells us we should cut Social Security, Medicare, and Medicaid. CLINTON: Well, the last point on this is, Senator Sanders, you're the only one on this stage that voted to deregulate the financial market in 2000, to take the cops off the street, to use Governor O'Malley's phrase, to make the SEC and the Commodities Futures Trading Commission no longer able to regulate swaps and derivatives, which were one of the main cause of the collapse in '08. CLINTON: There's plenty of problems that we all have to face together. SANDERS: Anyone who wants to check my record in taking on Wall Street, in fighting against the deregulation of Wall Street when Wall Street put billions of dollars in lobbying, in campaign contributions to get the government off their backs. They got the government off their backs. Turns out that they were crooks, and they destroyed our economy. I think it's time to put the government back on their backs. MITCHELL: ... Secretary Clinton, you mentioned earlier -- Secretary Clinton, do you want to respond? CLINTON: Well, I have actually documented every way that I'm going to pay for what I'm doing because I think the American public deserves to know. And, you can go to my website and actually see that. But, there are serious questions about how we're going to pay for what we want to see our country do. And, I'm the only candidate standing here tonight who has said I will not raise taxes on the middle class. I want to raise incomes, not taxes, and I'm going to do everything I can to make sure that the wealthy pay for debt free tuition, for child care, for paid family leave. To help us bring down student debt we're going to refinance that student debt, saving kids thousands of dollars. MITCHELL: ... Senator Sanders, let me ask you a question about taxes. SANDERS: Yeah. SANDERS: ... I got it. MITCHELL: In the last month was taxes. Now, in your healthcare plan, the plan you released tonight, you would not only raise taxes on the wealthy, but the details you released indicate you would raise taxes on the middle class also. Is that correct? SANDERS: What is correct, and I'm disappointed that Secretary Clinton's campaign has made this criticism. It's a Republican criticism. Secretary Clinton does know a lot about healthcare, and she understands, I believe, that a medicare for all, single payer program will substantially lower the cost of healthcare for middle class families. So, what we have got to acknowledge, and I hope the Secretary does, is we are doing away with private health insurance premiums. SANDERS: So, if I save you $10,000 in private health insurance, and you pay a little bit more in taxes in total, there are huge savings in what your family is spending. O'MALLEY: Senator, I'm the only person on this stage that's actually balanced a budget every year for 15 years. SANDERS: I was mayor for eight years, I did that as well. O'MALLEY: OK. So, that was eight years. Yes. And Senator, but I actually did it during a budget down time -- I mean, during a recession. And Andrea, the -- I had to make more cuts than any governor in the history of Maryland, but we invested more in infrastructure, more in transportation.We made our public schools more in America more than five years in a row,and went four years in a row without a penny's increase to college tuition. HOLT: We have got a lot to ground to cover here. Many Democratic voters are passionate about the need to do something to combat the threat of climate change, including the team of scientists from Youtube's MinuteEarth channel. (BEGIN VIDEO CLIP) ANNOUNCER: Hello from MinuteEarth. Fossil fuels have long kept our cars moving and our light bulbs lit. But we know that burning these fuels releases heat-trapping gases that are warming the planet, causing seas to rise and contributing to extreme weather events, like South Carolina's devastating flooding last year. Fighting human-caused climate change means giving up our global addiction to fossil fuels and shifting the bulk of the world's energy supply to alternative sources. Some countries have acted decisively to make this transition. But here at home, we still get a whooping 82 percent of our energy from coal, oil, and natural gas. In the U.S., political gridlock, pressure from industry lobbyists and insufficient R&D have made an already tough battle against climate change even tougher. HOLT: Senator Sanders, Americans love their SUVs, which spiked in sales last year as gas prices plummeted. How do you convince Americans that the problem of climate change is so urgent that they need to change their behavior? SANDERS: I think we already are. Younger generation understands it instinctively. It is amazing to me, and I think we'll have agreement on this up here, that we have a major party, called the Republican Party that is so owned by the fossil fuel industry and their campaign contributions that they don't even have the courage, the decency to listen to the scientists. It is beyond my comprehension how we can elect a president of the United States, somebody like Trump, who believes that climate change is a hoax invented by the Chinese. HOLT: Governor O'Malley, 30 seconds. Lester, on this stage tonight, this Democratic stage, where we actually believe in science. HOLT: That's time. We're going to take a break. HOLT: When we return, the late-breaking developments regarding Iran. The threat of ISIS now more real than ever on U.S. soil. Americans in fear and hearing few good answers. TODD: And we are back. I'm Chuck Todd. 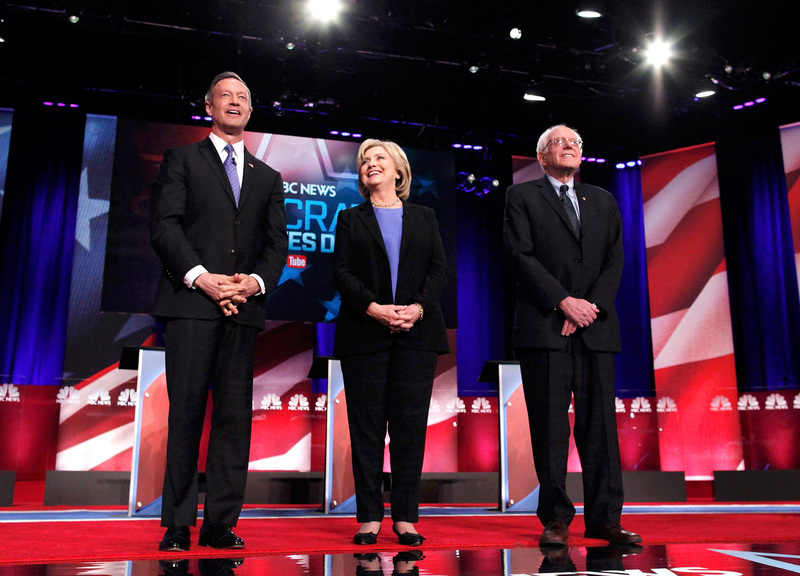 We are just past the halfway mark in our NBC News YouTube Democratic Candidates Debate. Boy, this is one that has actually lived up to the billing. We've seen some sharp exchanges on guns, health care and Wall Street -- the debate, you could argue, that has been largely focused on all things Bernie Sanders. He was on the defensive early, Hillary Clinton getting, I think, some control on the gun issue. But on health care and on Wall Street reform, it was Hillary Clinton on the defensive, and was a very aggressive Bernie Sanders. One thing of note here: Bernie Sanders very much being the sort of revolutionary candidate, major change, and you've heard a lot of Hillary Clinton saying things like she wants to build on the things that President Obama did, wrapping herself in President Obama. Let's go back downstairs and check in with our moderators, Lester and Andrea. So what's coming up next, guys? HOLT: Well, we've covered a lot of ground already, but we're gonna be talking about ISIS. A threat to America, it's -- always polls as one of the top concerns of Americans. And also some more late-breaking news. MITCHELL: We have all the news that has happened from Iran and the president's comments today, as well as what this means going forward for the War on Terror. What do we expect from Iran, and also what's happening in Syria? So a lot of foreign policy coming up. HOLT: A lot of debate to come. We'll be back in Charleston after this. TODD: You've got it. Well, it's the commander-in-chief test -- that's what's next. Stay with us -- the debate resumes right after this. HOLT: Charleston, Andrea Mitchell has questions now starting with Iran. Senator Sanders, the nuclear deal is now enforced. Iran is getting it's billions of dollars, several Americans who have been held are now going to be heading home. The president said today, "it's a good day. It's a good day for diplomacy. It's a time now to restore diplomatic relations for the first time since 1979 and actually re- opened a U.S. Embassy in Tehran." SANDERS: I think what we've got to do is move as aggressively as we can to normalize relations with Iran. Understanding that Iran's behavior in so many ways is something that we disagree with; their support terrorism, the anti-American rhetoric that we're hearing from of their leadership is something that is not acceptable. MITCHELL: Your response Secretary Clinton? CLINTON: Well, I'm very proud of the Iran Nuclear Agreement. I was very pleased to be part of what the president put into action when he took office. I was responsible for getting those sanctions imposed which put the pressure on Iran. It brought them to the negotiating table which resulted in this agreement. MITCHELL: You mentioned Syria. Let me ask you about Syria, all of you. Let's turn to Syria and the civil war that has been raging there. Are there any circumstances in which you could see deploying significant numbers of ground forces in Syria, not just specials forces but significant ground forces to combat ISIS in a direct combat role? Let me start with you Secretary Clinton. I have a three point plan that does not include American Ground forces. It includes the United States leading an air coalition which is what we're doing, supporting fighters on the ground; the Iraqi Army which is beginning to show more ability, the Sunni fighters that we are now helping to reconstitute and Kurdish on both sides of the border. MITCHELL: Senator Sanders, ground forces yes or no? SANDERS: As everybody you know, this is incredibly complicated and difficult issue and I applaud. I know President Obama's been getting a lot of criticism on this. I think he is doing the right thing. SANDERS: We should -- we should learn -- we should learn from King Abdullah of Jordan, one of the few heroes in a very unheroic place. And what Abdullah said is this is a war with a soul of Islam and that Muslim troops should be on the ground with our support and the support of other major countries. That is how we destroy ISIS, not with American troops in perpetual warfare. Andrea, governors have led us to victory in two world wars by doing what America does best, and that is by joining forces with others by acting in coalition. And I believe that President Obama is doing the right thing in this case. And I also want to add one other thing here. I appreciate the fact that in our debate, we don't use the term you hear Republicans throwing around trying to look all vibrato (ph) and macho sending other kids -- kids into combat, they keep using the term boots on the ground. A woman in Burlington, Iowa said to me, "Governor, when you're with your colleagues, please don't refer to my son who has served two tours of duty in Iraq as a pair of boots on the ground." Now, we need to be mindful of learning the lessons of the past. MITCHELL: I have a question. I have a question for Senator Sanders. Did the policies of the Obama administration, in which Secretary Clinton of course was a part, create a vacuum in Iraq and Syria that helped ISIS grow? SANDERS: No. I think the vacuum was created by the disastrous war in Iraq, which I vigorously opposed. Not only did I vote against it, I helped lead the opposition. And what happened there is yes, it's easy to get rid of a two-bit dictator like Saddam Hussein, but there wasn't the kind of thought as to what happens the day after you get him and what kind of political vacuum occurs. And who rises up? Groups like ISIS. MITCHELL: Secretary Clinton, I want to talk to you about red lines, because former Defense Secretary Chuck Hagel said in a recent interview that President Obama's decision to stand down on planned missile strikes against Damascus after Assad had used chemical weapons hurt the president's credibility. Should the president have stuck to his red line once he drew it? CLINTON: Look, I think that the president's decision to go after the chemical weapons once there was a potential opportunity to build on when the Russians opened that door resulted in a very positive outcome. We were able to get the chemical weapons out. MITCHELL: Your time is up. CLINTON: ... and go after ISIS, which I don't think would be a good idea. MITCHELL: You're out of time. SANDERS: Where Secretary Clinton and I think, I agree with most of what she said. But where I think we do have an honest disagreement, is that in the incredible quagmire of Syria, where it's hard to know who's fighting who and if you give arms to this guy, it may end up in ISIS' hand the next day. We all know that. O'MALLEY: But in all of that senator and secretary, I think we're leaving out something very important here. And that is that we still don't have the human intelligence: overt, in terms of diplomatic intelligence or covert, to understand even what the heck happens as the secondary and tertiary effects of some of these things. We are walking through this region, Andrea, without the human intelligence that we need. And we need to make a renewed investment as a country in bringing up a new generation of foreign service officers, and bringing up a new generation of business people and actually understanding and having relationships in these places. MITCHELL: Your time is us. Lester. HOLT: Senator Sanders mentioned Russia a moment ago. Secretary Clinton, you famously handed Russia's foreign minister a reset button in 2009. Since then, Russia has annexed Crimea, fomented a war in Ukraine, provided weapons that downed an airliner and launched operations, as we just did discuss, to support Assad in Syria. As president, would you hand Vladimir Putin a reset button? CLINTON: Well, it would depend on what I got for it and I can tell you what we got in the first term, we got a new start treaty to reduce nuclear weapons between the United States and Russia. We got permission to resupply our troops in Afghanistan by traveling across Russia. HOLT: What's your relationship with him? CLINTON: Well, my relationship with him, it's -- it's interesting. HOLT: We to want turn right now to the issue of balancing national security concerns with the privacy rights of Americans. That brings us to YouTube and this question. BROWNLEE: Hi, my name Marques Brownlee, and I've been making YouTube videos about electronics and gadgets for the past seven years. I think America's future success is tied to getting all kinds of tech right. Tech companies are responsible for the encryption technology to protect personal data, but the government wants a back door into that information. So do you think it's possible to find common ground? And where do you stand on privacy versus security? I believe whether it's a back door or a front door that the American principle of law should still hold that our federal government should have to get a warrant, whether they want to come through the back door or your front door. You have all talked about what you would do fighting ISIS over there, but we've been hit in this country by home-grown terrorists, from Chattanooga to San Bernardino, the recent shooting of a police officer in Philadelphia. How are you going to fight the lone wolves here, Senator Sanders? HOLT: That's a question to Senator Sanders. I wasn't clear, I apologize. SANDERS: OK. I just wanted to add, in the previous question, I voted against the USA Patriot Act for many of the reasons that Governor O'Malley mentioned. But it is not only the government that we have to worry about, it is private corporations. HOLT: We have to go to a -- we have to go to a break, and when we come back, we're going to get to some of the burning questions these candidates have yet to answer and are totally eager to talk about. CLINTON: Oh, we're breaking? OK.
HOLT: And welcome back to Charleston. As we were going to a break, Secretary Clinton, I cut you off. I'll give you 30 seconds to respond on the issue of lone wolves. O'MALLEY: Can I get 30 seconds, too? SANDERS: Can I get 50 seconds? CLINTON: Well, I wanted to say, and I'll do it quickly, I was very pleased that leaders of President Obama's administration went out to Silicon Valley last week and began exactly this conversation about what we can do, consistent with privacy and security. HOLT: And Andrea has a follow-up. MITCHELL: Just a -- just a quick follow-up, though, Secretary Clinton. Just a moment, Governor. O'MALLEY: Andrea, when can I get my 30 seconds? MITCHELL: But -- but -- Secretary Clinton, you said that the leaders from the intelligence community went to Silicon Valley, they were flatly turned down. They got nowhere. CLINTON: That is not what I've heard. Let me leave it at that. O'MALLEY: Andrea, I need to talk about homeland security and preparedness. Ever since the attacks of September 11th -- 30 seconds. Ever since the attacks of September 11th, my colleagues, Democratic and Republican mayors, Democratic and Republican governors, made me their leader on homeland security and preparedness. O'MALLEY: Here in the homeland, unlike combating ISIL abroad, we're almost like it's -- your body's immune system. It's able to protect your body against bad bugs, not necessarily because it outnumbers them, but it's better connected -- the fusion centers, the biosurveillance systems, better prepared first responders. ... we do have to move on. SANDERS: Can I get a -- can I just get a very brief response? Very brief. HOLT: Thirty -- 30 -- 30 seconds, Senator. SANDERS: OK. One -- and I agree with what the secretary said, and what Governor O'Malley said. But here's an issue that we also should talk about. We have a $600 billion military budget. It is a budget larger than the next eight countries'. Unfortunately, much of that budget continues to fight the old Cold War with the Soviet Union. Very little of that budget -- less than 10 percent -- actually goes into fighting ISIS and international terrorism. We need to be thinking hard about making fundamental changes in the priorities of the Defense Department. ... this is the first time that a spouse of a former president could be elected president. You have said that President Clinton would advise you on economic issues, but be specific, if you can. Are you talking about a kitchen-table role on economics, or will he have a real policy role? ... I'm going to have the very best advisers that I can possibly have, and when it comes to the economy and what was accomplished under my husband's leadership and the '90s -- especially when it came to raising incomes for everybody and lifting more people out of poverty than at any time in recent history -- you bet. HOLT: Senator sanders, a 30 second response, sir. SANDERS: Great ideas, Governor O'Malley, Secretary Clinton, but here's the truth. If you have an administration stacked with Wall Street appointees, it ain't going to accomplish very much. So here's a promise that I make -- and I mentioned a moment ago how corrupt the system is -- Goldman Sachs, paying a $5 billion fine, gives this country, in recent history, a Republican secretary of treasury, a Democratic secretary of treasury. MILLER: Senator Sanders, let me ask you a question. You called Bill Clinton's past transgressions, quote, "totally, totally, totally disgraceful and unacceptable." Senator, do you regret saying that? SANDERS: I was asked a question. You know, one of the things, Andrea, and I -- that question annoys me. I cannot walk down the street -- Secretary Clinton knows this -- without being told how much I have to attack secretary Clinton, want to get me on the front pages of the paper, I'd make some vicious attack. I have avoided doing that. Trying to run an issue-oriented campaign. SANDERS: I was asked a question. MILLER: You didn't have to answer it that way, though. Why did you? SANDERS: Well -- then if I don't answer it, then there's another front page, so it's yes (ph). And I mean this seriously. You know that. We've been through this. Yes, his behavior was deplorable. Have I ever once said a word about that issue? No, I have not. I'm going to debate Secretary Clinton, Governor O'Malley, on the issues facing the American people, not Bill Clinton's personal behavior. HOLT: We will take a break. We'll continue from Charleston right after this. HOLT: Welcome back everybody. Finally, before we go tonight, we set out here to understand points of differences between you. We believe we've learned a lot here, but before we leave, is there anything that you really wanted to say tonight that you haven't gotten a chance to say. And, we'll start with Governor O'Malley. HOLT: Didn't see that coming, did you? O'MALLEY: Yes, but we're going to have to get 20 minutes to do it, so. O'MALLEY: I believe there are many issues. I have 60 seconds for this? HOLT: Sixty seconds, we'd appreciate it. O'MALLEY: There are so many issues that we haven't been able to discuss here. We have not fully discussed immigration reform, and the deplorable number of immigrant detention camps that our nation's now maintaining. We haven't discussed the shameful treatment that the people of Puerto Rico, our fellow Americans, are getting treated with by these hedge funds that are working them over. O'MALLEY: We haven't discussed the fact that in our hemisphere we have the danger of nation-state failures because of drug traffickers; and Honduras, and Guatemala and El Salvador. I guess the bottom line is this, look we are a great people the way we act at home and abroad based on the beliefs that unite us. Our belief in the dignity of every person, our belief in our own common good. There is now challenge that is too great for us to overcome provided we bring forward in these divided times, new leadership that can heal our divides here at home and bring our principles into alignment abroad. We're on the threshold of a new era of American progress and I believe we have only need to join forces together and cross that threshold into a new era of American prosperity. CLINTON: Well Lester, I spent a lot of time last week being outraged by what's happening in Flint, Michigan and I think every single American should be outraged. We've had a city in the United States of America where the population which is poor in many ways and majority African American has been drinking and bathing in lead contaminated water. And the governor of that state acted as though he didn't really care. He had request for help and he had basically stone walled. I'll tell you what, if the kids in a rich suburb of Detroit had been drinking contaminated water and being bathed in it, there would've been action. So I sent my top campaign aide down there to talk to the mayor of Flint to see what I could to help. I issued a statement about what we needed to do and then I went on a T.V. show and I said, "it was outrageous that the governor hadn't acted and within two hours he had." CLINTON: I want to be a president who takes care of the big problems and the problems that are affecting the people of our country everyday. SANDERS: Well, Secretary Clinton was right and what I did which I think is also right, is demanded the resignation of governor. A man who acts that irresponsibly should not stay in power. Now, we are a great nation -- and we've heard a lot of great ideas here tonight. Let's be honest and let's be truthful. Very little is going to be done to transform our economy and to create the kind of middle class we need unless we end a corrupt campaign finance system which is undermining American democracy. We've got to get rid of Super PACs, we've got to get rid of Citizens' United and what we've got to do is create a political revolution which revitalizes American democracy; which brings millions of young people and working people into the political process. To say loudly and clearly," that the government of the United States of America belongs to all of us and not just a handful of wealthy campaign contributors." HOLT: All right. Well thank you and thanks to all of you for being here tonight shedding light on some of the differences as Americans get ready to vote. I also want to thank the Congressional Black Caucus Institute and certainly my friend and colleague, Andrea Mitchell. This has been great. It's been a great spirited conversation and American people appreciate it.